Step One: In a skillet, saute the onions and garlic in butter until they are softened. While that’s happening, prep the other ingredients – except for the gouda – in a large bowl and gently mix together. Step Two: Add the meat mixture to the skillet and using two wooden spoons, incorporate the onion and garlic butter into it. Let this simmer on a low heat, stirring occasionally for about 5 minutes. Step Three: I used a medium size, 2 inch deep oval casserole – square is fine – but deep is necessary. Butter the casserole or baking dish. 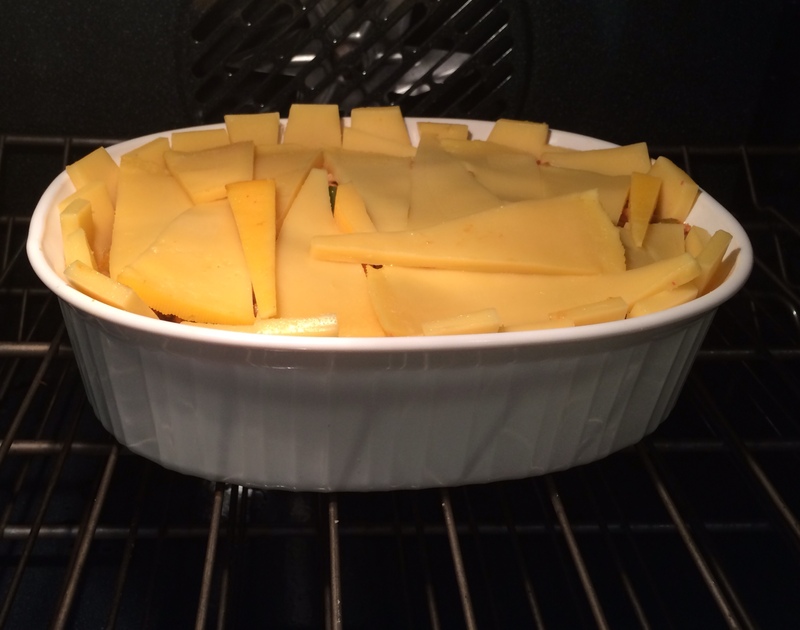 Slicing your gouda, begin by placing a layer in the bottom of the dish – think “puzzle”, cover the bottom completely. 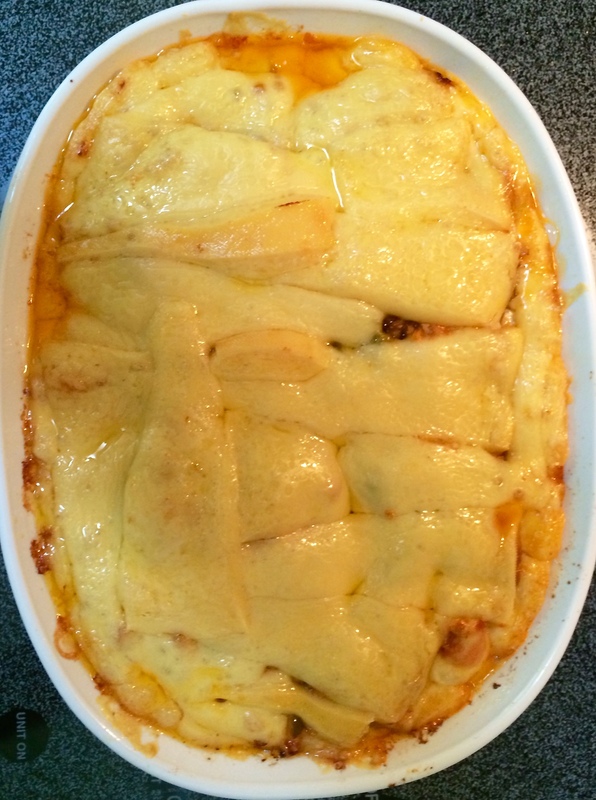 Notice the cheese rim along the inside edges…..
Bake at 325 degrees for 45 – 50 minutes. After removing from the oven, let it rest a minimum of 5 minutes before serving. Just out of the oven, the aroma is tantalizing…it takes will power to wait those 5 minutes. We served this in a bowl with a glass of Pinot Grigio which was the perfect pairing. Here’s a bit of history that I found while researching the recipe, (source Huffington Post). When it came to the table, the Dutch liked their Gouda cheese, and their Edam cheese — both of them shipped to Curaçao in round formats. The Dutch “masters” couldn’t be bothered with the rind of these cheeses, so the milky-creamy part at the center of the cheese got scooped out and consumed; the hollowed-out cheese shells were returned to the kitchen as refuse. Often, the slave is wiser than the master; they certainly were in this case. The kitchen workers noticed other foods coming back from the dining room — such as pieces of chicken and other meats, left over from stews. It was a logical leap from there: Season the meats, add something a little sweet (like raisins), add some favorite island ingredients (today, olives are common), stuff the cheese shells with the meat mixture, and steam the stuffed cheeses gently in a bain-marie for a few hours. The result is a perfect marriage of cultures: the stolid creaminess of the North meets the lively spiciness of the South.